Kelty might be famous for their backpacks but anyone who is familiar with the brand will know that their tents are equally impressive.as the rest of their camping gear. With models ranging from 1 to 8 person tents, anyone regardless of experience can find a Kelty tent that will meet their needs for any camping trip. The brand does have quite a few different two-person tents models which are popular for couples and individuals alike. 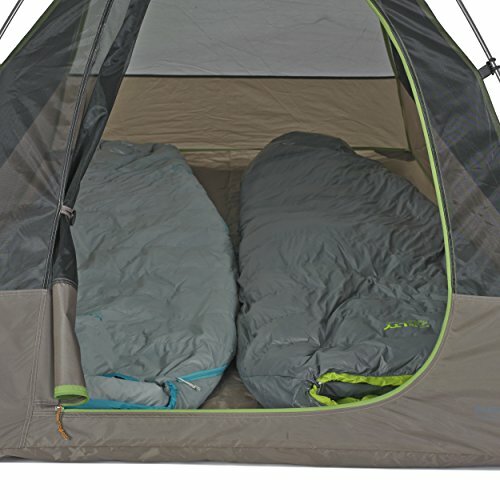 One of their most popular two-person tents is the Grand Mesa 2. Check out our detail written Kelty Grand Mesa 2 review to see all the details about this tent design and take the right decision. The Grand Mesa 2 is a beautifully built, sleek gray and green tent that is surprisingly roomy and spacious for its compact size, perfect for a hiking night. 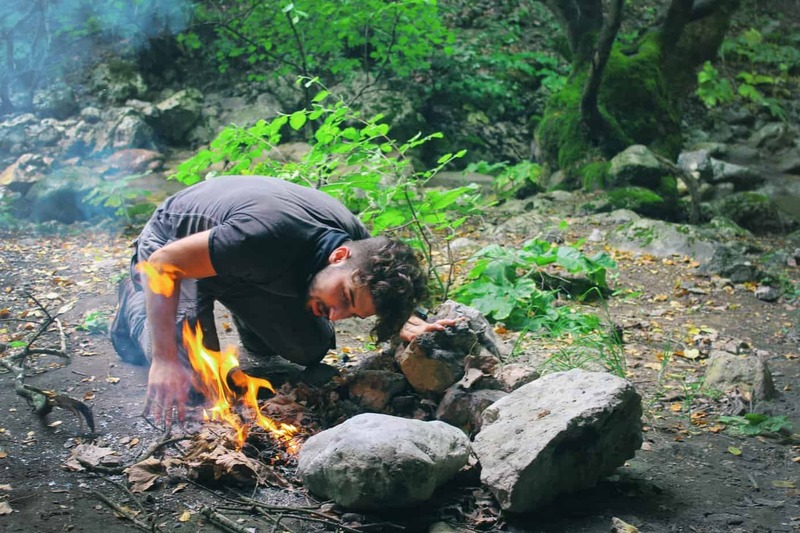 It is lightweight enough that it can easily be packed out into the wilderness without having to split the load with your camping buddy while sleeping. If you are a solo camper who wants the extra room of a 2 person tent spacious interior or someone that likes to take a friend or family member, the Grand Mesa 2 would be a great choice for most anyone. The Grand Mesa 2 is definitely a more basic tent but for the purposes of a 2 person or roomy 1 person shelter is provides all of the necessities for a dry, comfortable camping trip in a great shelter. If you need more specifics about this waterproof model, it would be best to contact Kelty for further information or to answer any questions you may have. Simplicity is never a bad thing when it comes to a tent and this bacpacking tent is definitely one of those no-frills, reliable waterproof tents that will always perform as expected. In today’s world, it’s no surprise that saving money is a priority for many people. It can be tough to find a tent that is budget-friendly but truly good quality, unlike so many of the cheap big box store tents. The Grand Mesa 2 is very low in price compared to its true value and it is a great piece of camping gear. Despite its small size the Grand Mesa 2 is very durable and spacious. 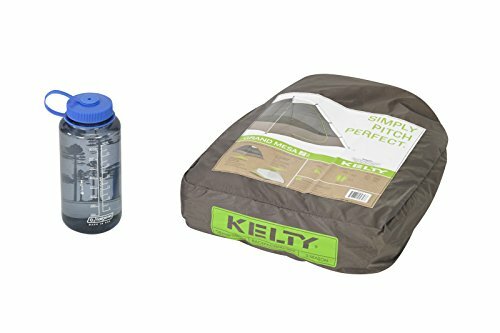 Kelty naturally used high quality material that can put up with a lot of wear and tear even with inclement weather during your camping trip. They also designed the tent in a streamlined shape which goes far in improving stability in high winds and also helps shed rain much more quickly. The PU coating on the floor and rainfly keeps out moisture but the double-wall with mesh delivers plenty of airflow to keep things fresh and reduce condensation. The No-See-Um mesh also makes this tent perfect for those warm summer sleeping nights when you’d rather be looking at the stars but don’t want to have to deal with pesky bugs. Going back to the waterproofing capabilities, the floor of the Grand Mesa 2, unfortunately, isn’t the bathtub style but they do use powerful seam taping closure which should keep you dry in all but the worst rain storms. Even though there haven’t been complaints of leakage through the interior, it’s something to keep in mind if you regularly camp in very wet conditions of inclement weather. The tent only uses 2 lightweight aluminum poles, which is quality material and actually fold down to make them easy to pack your backpacking trip camping equipment. The poles aren’t a super strong alloy aluminum but perform very well in keeping the tent stable and rigid. Setup is very quick since the tent attaches to the poles via color-coded clips. The rainfly also attaches the same way. The D-shaped door is located at the front of the tent so you don’t need to worry about climbing over your camping partner or gear to get out through the door. The vestibule over the door prevents rain or dew from entering the tent, plus it gives you a place to leave dirty boots and clothes. As for storage, the tent has plenty of pockets in his spacious interior for two people to store small items like flashlights, phones, GPS, maps, snacks, etc. 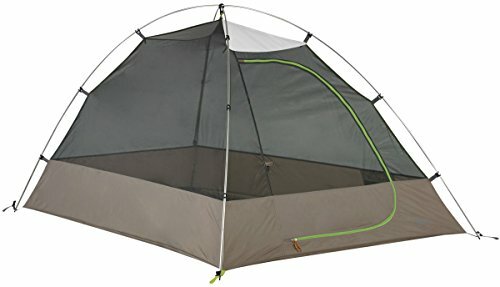 There are also loops at the top of the tent for a gear loft if you so happen to want to use one (sold separately, however). If you are a single person that like the extra space in the interior of a two-person vs a one person tent, you’ll have plenty of room for your gear and camping equipment. There are a few aspects about this tent that may be a disadvantage for some people who are looking the perfect tent for sleeping in the outdoors. First off, like so many other tents on the market, this model doesn’t come with its own gear loft or footprint. These would have to be purchased separately, but it still will fit your backpacking needs. Another common complaint from backpackers is the weight of this tent. Even though its spacious and it is less than 5lbs, it is still fairly heavy for a 2 person capacity shelter when compared to 4 person tents that can be found within a 5lb range. The weight makes this tent unsuitable for light or ultralight backpackers but still very comfortable to carry for the car camper or casual backpacker who doesn’t hike far. One other consideration to keep in mind is that if you rely heavily on guy lines you may end up wanting to upgrade the stakes and cord that come with the tent. Depending on the ground, the stakes may not be durable enough to take repeated hard use. The guy line is a bit short for some people’s personal preferences for backpacking as well. Campers who are very tall or simply not comfortable cozying up with their camping partner may find the Grand Mesa 2 to be a little too small for their fit. In fact, many backpackers that choose this tent tend to only go solo and find this model to be very roomy for an individual who wants to keep their gear inside with them. Overall the disadvantages of this tent definitely don’t outweigh the positives but are still considerations to keep in mind when doing comparison shopping. 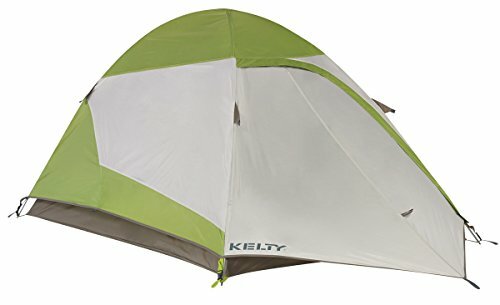 Kelty is known for their amazing tents and even though the Grand Mesa 2 isn’t without a couple flaws, it still outperforms many other 2 person tents on the market. One wonderful thing about Kelty is if you find that you enjoy the Grand Mesa 2 but wish it was a bit roomier, you can find the exact same “Grand Mesa” model in a larger 4 person capacity. The brand also offers an excellent return policy and a lifetime guarantee on this tent so if you don’t love it, you can return it for a full refund. If you do love it you can rest assured that you can get a replacement should something happen to it. If you’re in the market for a roomy 1 person tent or a well-built 2 person tent, the Grand Mesa 2 should definitely be on your list to check out. You can see the listing here for the top price.